If you don't know how to use expressions but want to take advantage of the power expressions can bring to your animation then this is the tool for you. 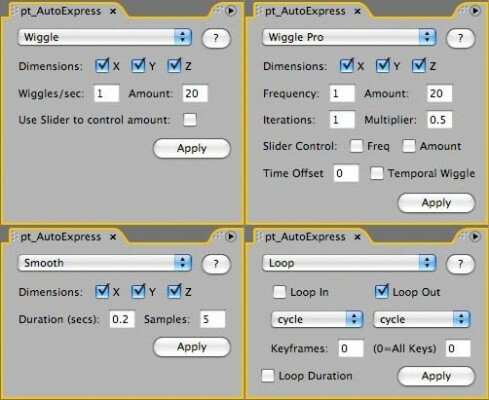 Automatically add wiggle, smooth and loop expressions to any selected properties without requiring any knowledge of expressions. Just select the property you would like to add the expression to and then choose which expression you would like to apply from the script UI. Watch the demo video for a more detailed tutorial on how to use this script.